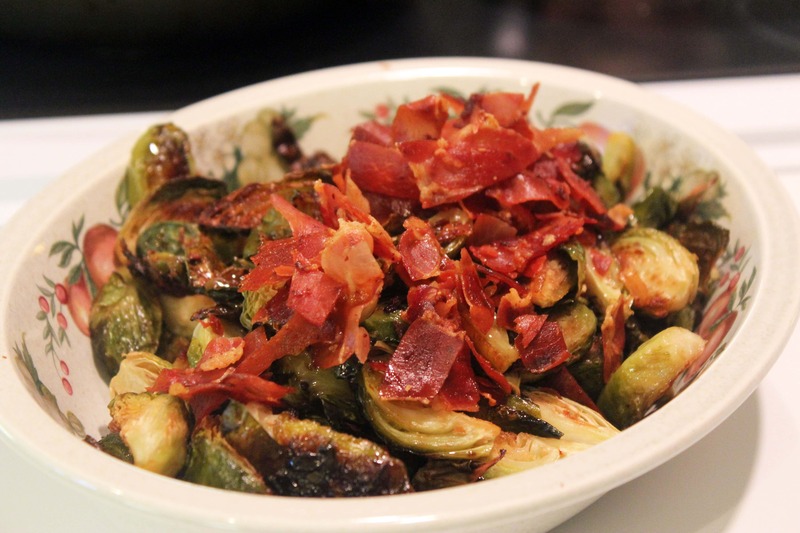 Do you people hate brussels sprouts too? I HATED them growing up, and now, when I make them, I have to be pretty careful to cook them in a way that doesn’t in any way yield a mushy consistency, because then I revert to being a 5 (fine, 8) year old and want to chew my food and stick bits of it under my chair cushion to avoid having to swallow it. Anyway, this is a nice way to eat brussels sprouts. I decided awhile ago that I should learn to cook them, because they’re totally trendy right now, and I’m all about following the crowd. And, if Food Network ever comes-a-callin’, I want to be super ready with an arsenal of random Chopped-style ingredients from which to cook. You know, because that’s going to happen any day now. This has no measurements! You’ll love it! Trust me. 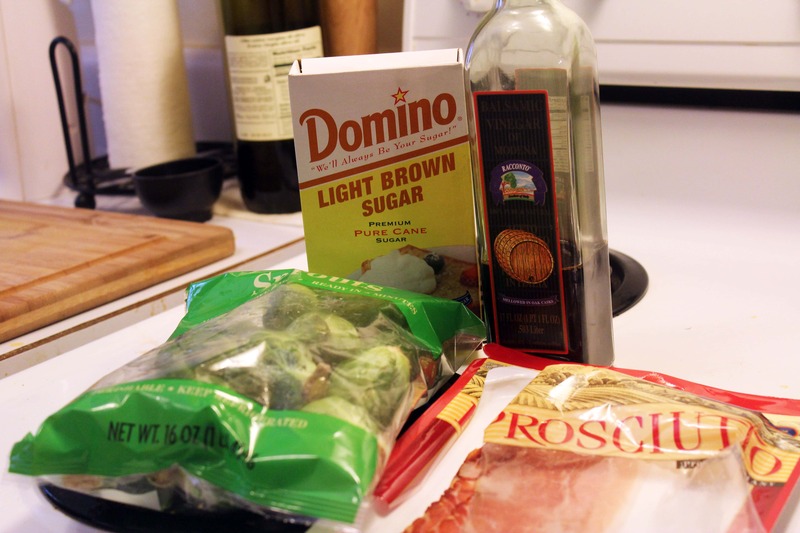 Oh, because they’re so stinky, brussels sprouts are kind of cheap, so…we win again! They are delicious, but they ARE stinky. There’s no way around that. Then preheat the oven to 425F. 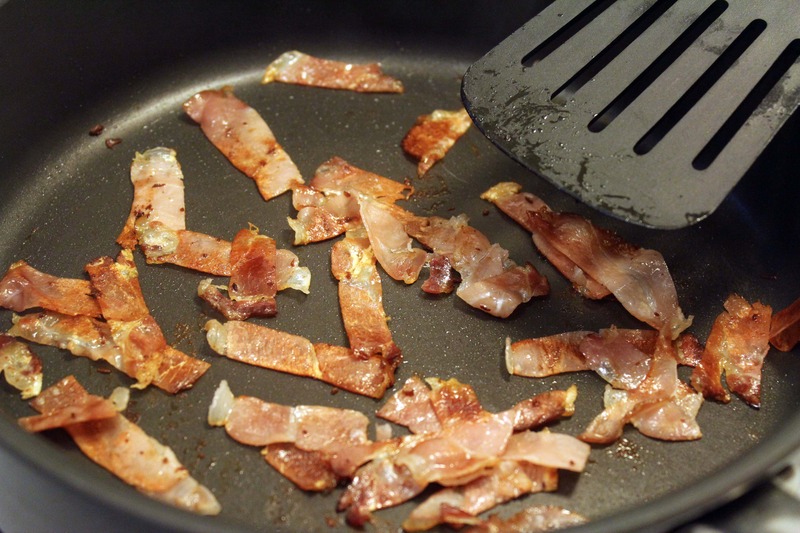 Now, for the topping, you’re going to crisp the pork product of your choice – prosciutto, in my case. 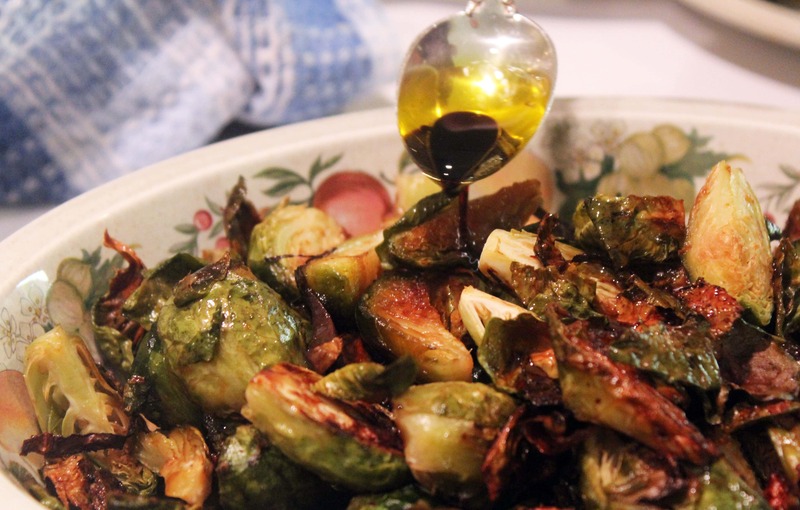 You can do this while the sprouts roast, or you can do it well in advance – it’s totally up to you! 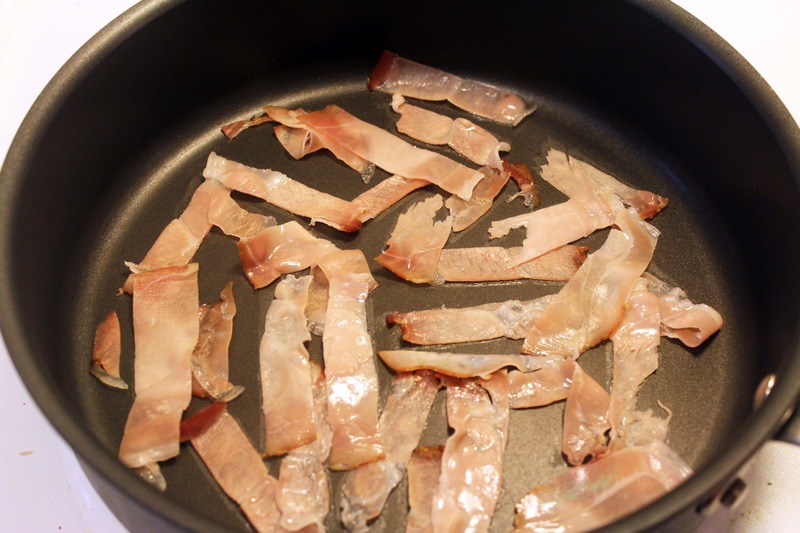 In any case, cut the prosciutto in strips, then place it in a pan over medium high heat for 10 minutes or so until it’s nice and crispy. Set it aside until you’re ready to use it! 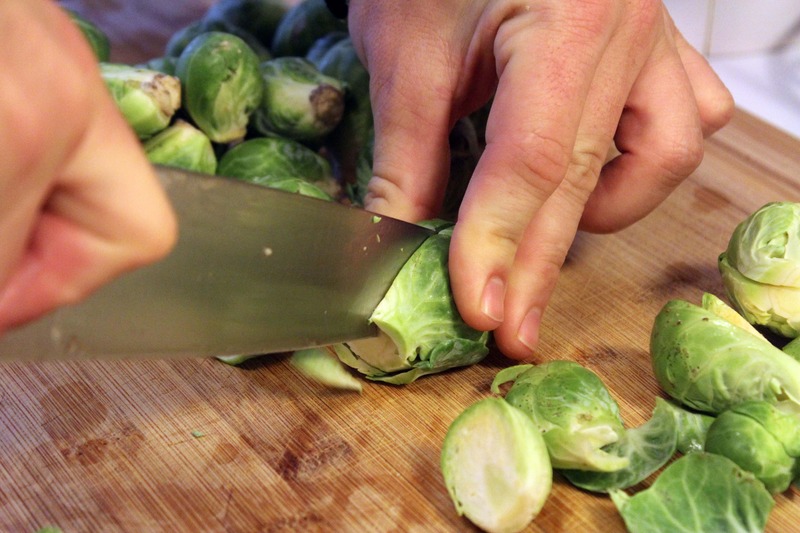 Cut off the teensy ends of the sprouts, the halve or quarter them if they are large. If they’re teeny (1 inch in diameter or so), leave them whole! 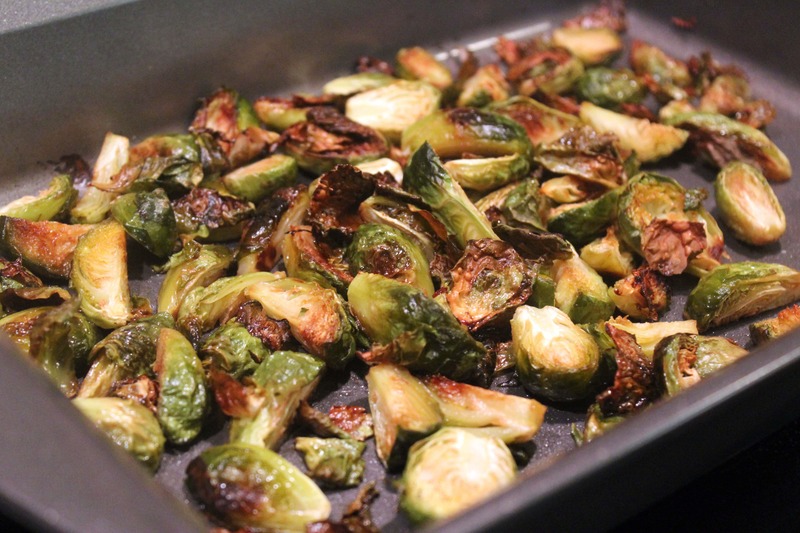 Place the sprouts in a roasting pan, baking dish, or sheet pan with a rim – whatever works for you works for me, promise! 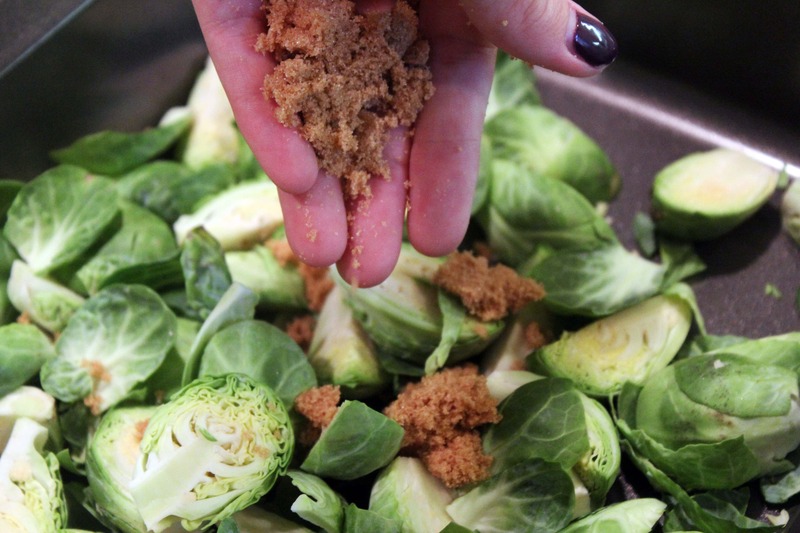 Sprinkle the sprouts with a bit of salt and brown sugar – 1/2 teaspoon salt and 1 tablespoon sugar for 4 portions should be a good start, but add as much as you’d like! Add crushed red or black pepper here, too. 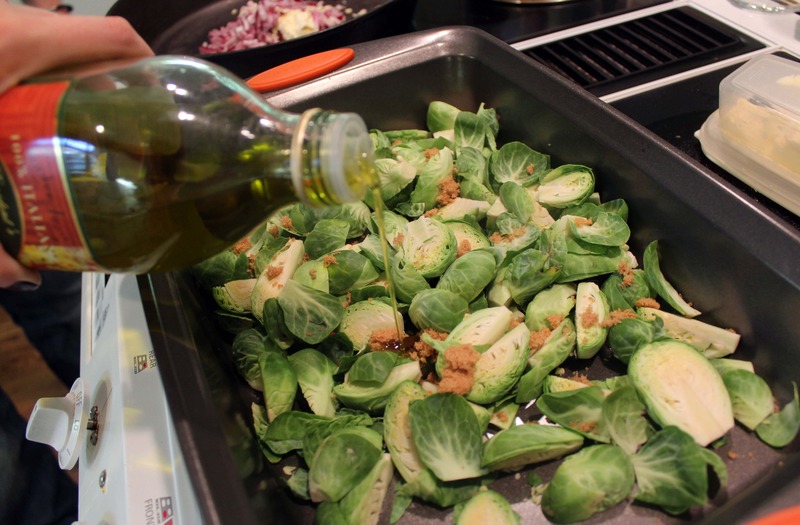 Then, drizzle the sprouts lightly with olive oil – 1 teaspoon per person is plenty. Don’t drown them! See? Hardly any sugar. Just a few bits here and there for fun surprises of sweetness. Roast the sprouts for 20-30 minutes until they are cooked through and dark brown at the edges – that’s melted sugar, which is SUPER delicious. You can toss them once during the roasting if you’re feeling concerned. Right before you serve, drizzle on some balsamic vinegar and crumble the prosciutto on top. That was balsamic olive oil that I had made a few weeks prior and needed to use up, but straight balsamic is just as good. Now, tomorrow we’ll discuss the risotto that you can see in the corner of this picture, but for today, may I suggest that you serve these sprouts with the following? 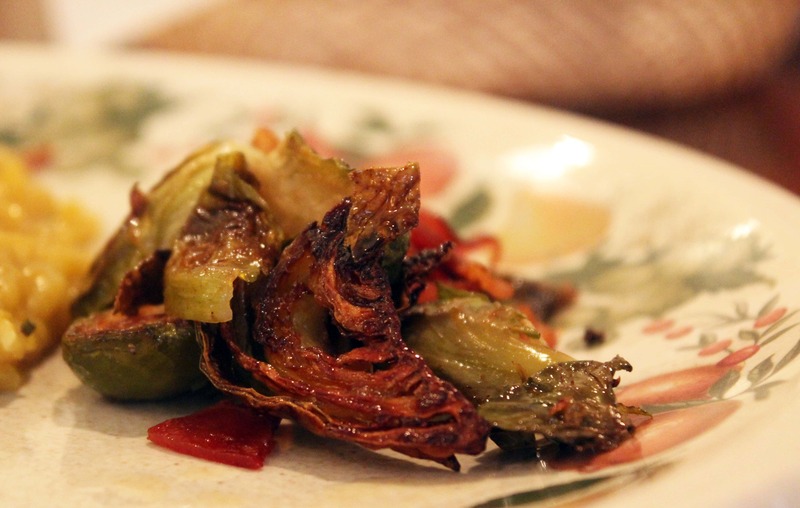 You can make most of this while the brussels sprouts roast! Spatzle, or some other sweet pasta. Yes. Do that. I just suggested a meal that involves fried meat, cheese, and pork. What more do you want from me? Looks delicious! great pictures. I actually really like sprouts but only when cooked nicely like this. I like them with garlic and oil (on my blog). Ahhhh I love garlic oil! I keep some around all the time for drizzling on roasted veggies and dipping bread in. It’s so easy to make and adds so much to dishes! Me too! Love it! I use it all the time! Terrific idea …. really innovative!